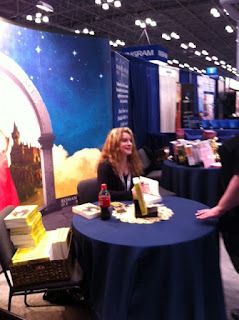 Yesterday was the last day at BEA 2012 ... and I have to say: it was a blast! 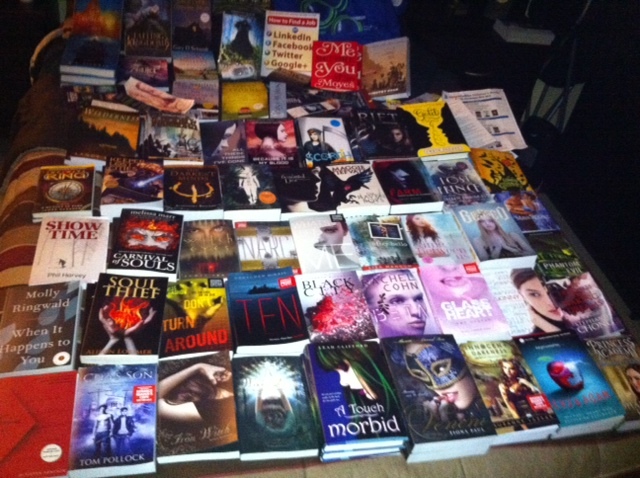 This was only my second year at BEA and it just ended, but I have to say: I can't wait until next year. BookExpo America is such a great experience with all the new free books, meeting writing ideals and mingling with all sorts of new people. 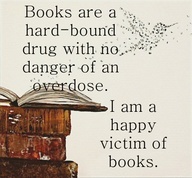 Especially fellow YA book bloggers. 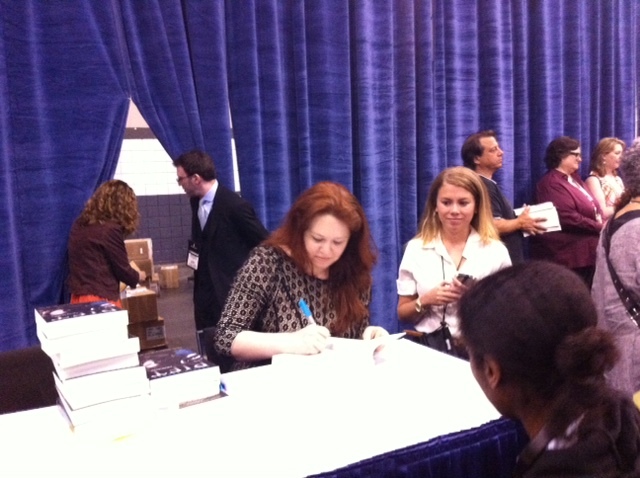 My second stop at BEA 2012: Andrea Cremer's signing of RIFT in the Autographing section. 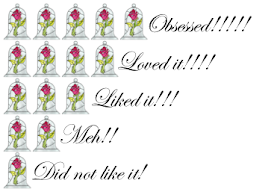 *My first stop was Gabrielle Zevin's signing but I didn't get a picture; she's the author of BECAUSE IT'S MY BLOOD & ALL THESE THINGS I'VE DONE. 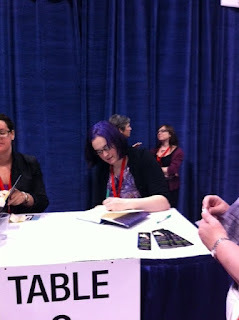 My third stop at BEA 2012: Autographing section signing of A TOUCH MORBID, sequel to A TOUCH MORTAL by Leah Clifford. My seventh stop at BEA 2012: Getting my autographed copy of BLESSED written by Tonya Hurley. Before this stop, my brother and I got DON'T TURN AROUND by Michelle Gagnon, Gretchen Mcneil's TEN, GLASS HEART written by Amy Garvey, and Lisa Mangum's AFTER HELLO. End of Day 1 count. Although BEA was done for the day at around 4:30 pm or 5, I didn't get home home until after 10pm and I was completely beat. 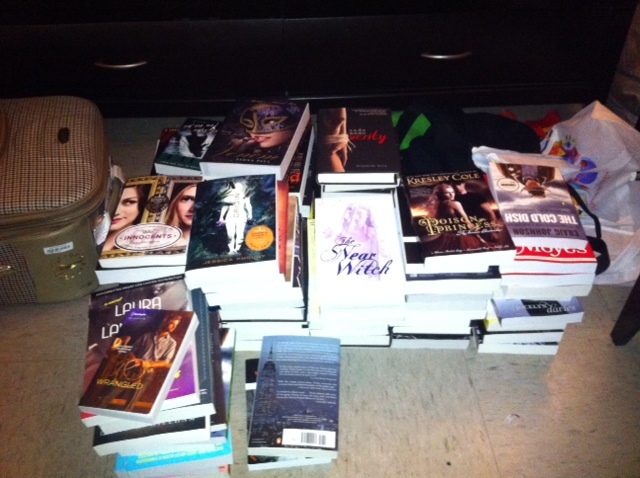 But it was worth it because I attended the Teen Author Carnival for the first time. The "carnival" has been hosted by Devyn Burton, Mitali Dave & Korianne Wey for the last four years. 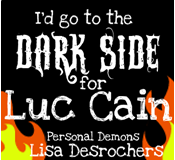 It is an event held at Jefferson Market Library that is opened to the public to enjoy a night of fun with favorites among authors of YA. 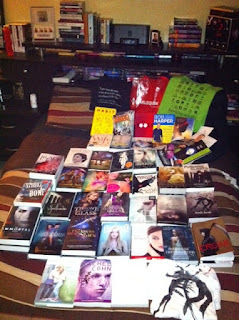 There were nine panels, some prizes *swag and books* as well as a book signing. Can't wait to crack the covers of EVE AND ADAM written by Michael Grant & Katherine Applegate, BLACK CITY by Elizabeth Richards, RIFT by Andrea Cremer. Just as the day before, my second day at BEA was quiet eventful. And I wouldn't have had it any other way. 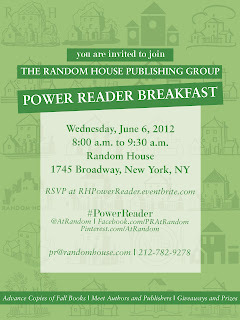 To start the morning off I attended the Random House Power Reader Breakfast. 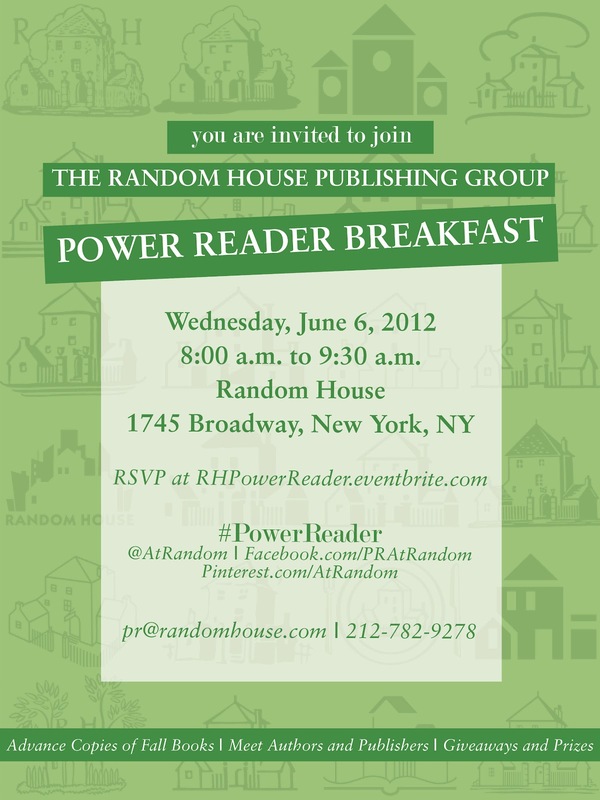 Only a couple of weeks before, and much to my delight, I received an email from Random House inviting me to the private event. 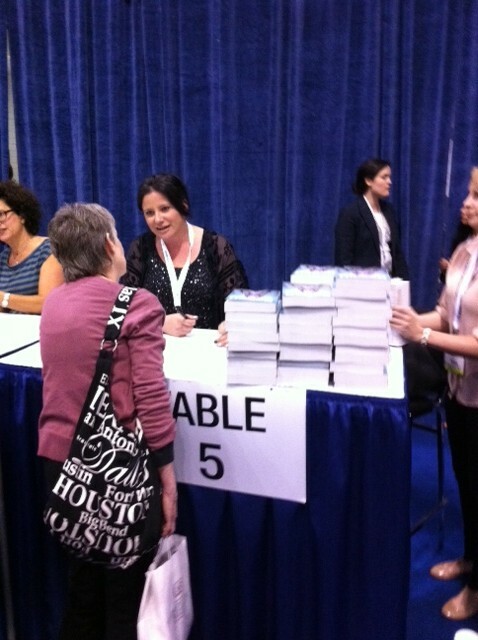 Attendees were able to meet and greet with publishers, publicists, authors, other bloggers and more. 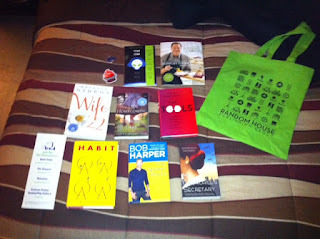 Some upcoming Fall books were introduced to us and a few authors gave speeches on said books. After leaving TAC (Teen Author Carnival) I headed straight over to Javits Center. Since the breakfast was over at 9:30am and BEA opened up at 9, my brother waited on line for our first stop planned for the day . . . Becca Fitzpatrick's signing. 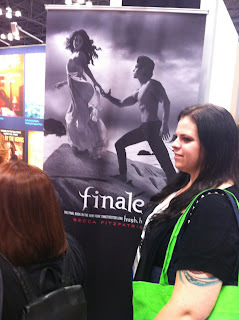 FINALE ARCs being signed by her was my most anticipated event of BookExpo 2012. So you can imagine my dismay when I arrived only to find out that Simon & Shuster had her signing paperback copies of HUSH, HUSH instead. Considering that Penguin already disappointed me with a similar stunt on Tuesday when they had Ally Condie signing paperback copies of MATCHED instead of the advertised REACHED ARCs. Afterwards, my brother and I had several book signing stops on my plan of attack list. 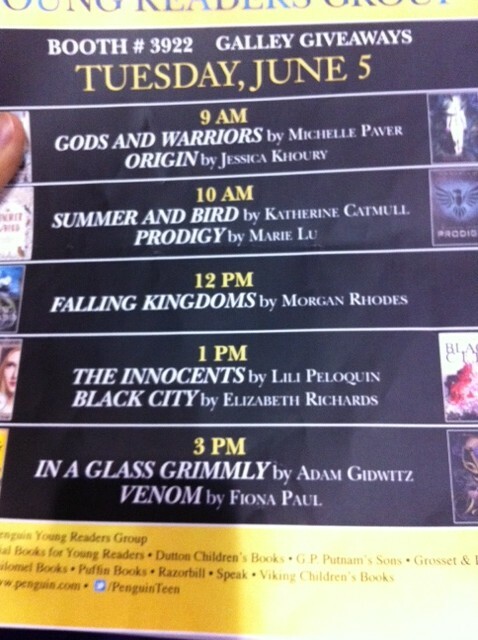 Our next stops included signings of Sarah J Maas' THRONE OF GLASS, GIRL IN THE CLOCKWORK COLLAR by Kady Cross, and Julie Kagawa's THE IRON KING. INVISIBLE SUN written by David Macinnis Gill, Maureen Johnson's THE NAME OF THE STAR, FOR DARKNESS SHOWS THE STARS by Diana Perefreund, and Gennifer Albin's CREWEL. 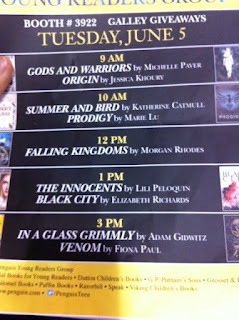 There were also several drops going on at publisher booths. 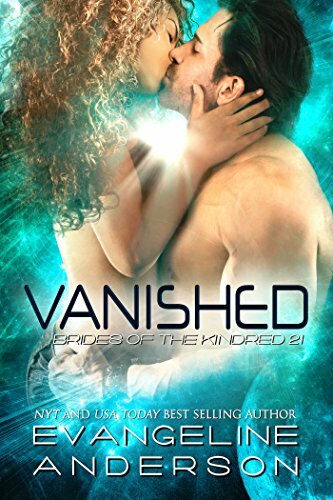 Some of which included galleys of IN A GLASS GRIMMLY written by Adam Gidwitz, GODS AND WARRIORS by Michelle Paver, Jessica Khoury's ORIGIN, THE INNOCENTS by Lili Peloquin, Jessica Shirvington's ENTICE, Janet Gurtler's WHO I KISSED as well as WHAT'S LEFT OF ME written by Kat Zhang. 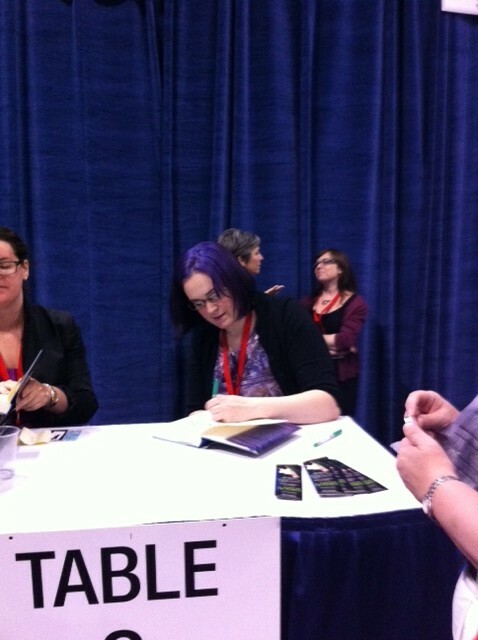 My seventh stop on the agenda at BEA 2012: Aimee Carter at Autographing area signing GODDESS INTERRUPTED, sequel to THE GODDESS TEST. 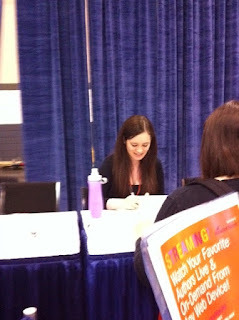 As I waited to meet Carter, my brother waited on the line to get me a copy of CROAK by Gina Damico. 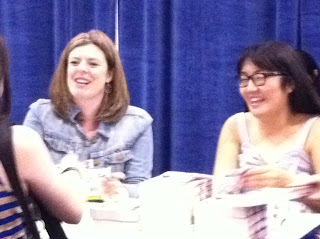 We also snagged signed copies of Rachel Cohn's BETA and THE IMMORTAL RULES written by Julie Kagawa before the end of the day. Here's a bonus shot, from when I was on line for THRONE OF GLASS by Sarah J. Maas, of the never aging Jane Seymour. 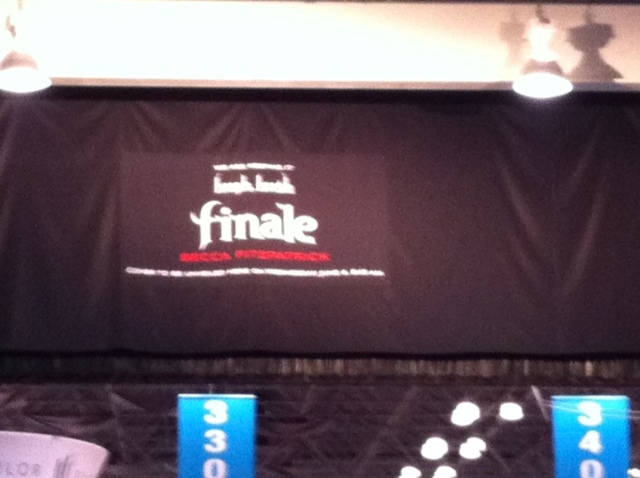 The third and final day of BEA wasn't has hectic as the first two and my brother and I left early -- around 1/1:30 pm. 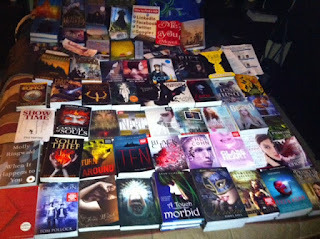 Nonetheless, I still got to meet a few more great authors and get some awesome books. 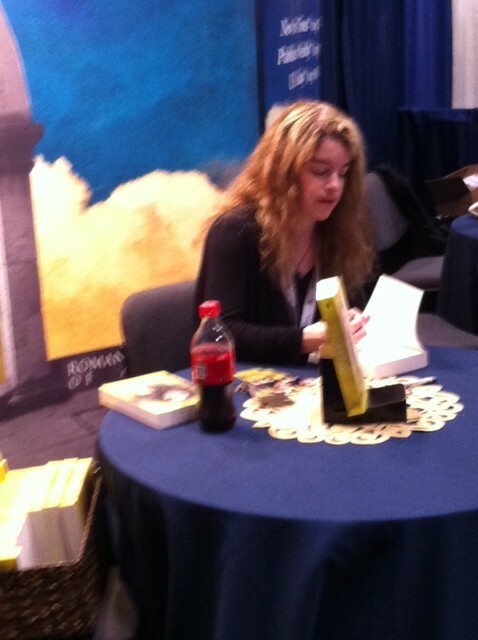 First stop on the agenda for BEA 2012: InBooth signing of SHINE written by Jeri Smith-Ready. My second stop at BEA 2012: Jenny Han and Siobhan Vivian signing copies of BURN FOR BURN. Final day count. Not bad for a few hours short. Perhaps I see an abundance of giveaways in the future . . . I'm sooooo jealous!!! 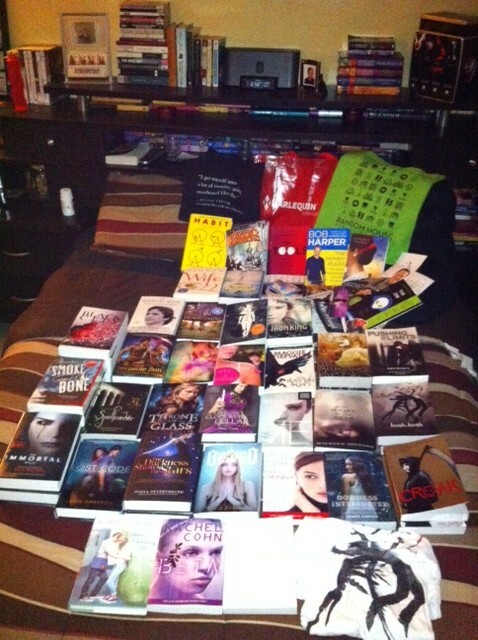 Soooooo freaking jealous!!!!! :)haha only messing! happy reading! Hehe ... Next year, girl!!! 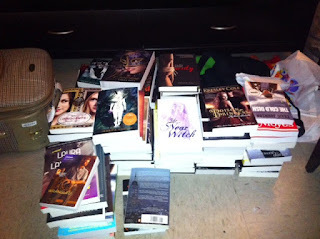 Yes, it can get out of control ... but I was fortunate enough to have my brother's help. Did you have fun at BEA?